The setup is the same as Neutral Zone Puck Skills #1. This time the player pushes the puck out past the puck on their forehand and pulls it back towards them with the toe. Then they pull the puck to their backhand around the next puck. The puck protection along the wall stays the same. This time when coming back along the straight line of pucks players will try to add and extra stickhandle between the pucks. 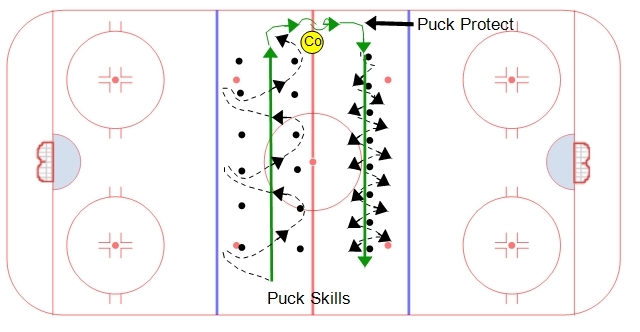 If you are planning a station practice then your can browse more drills for other areas of the ice in our station drills section.